In early October, Saudi Arabia’s representative to OPEC surprised attendees at a New York seminar by revealing his government was content to let global energy prices slide. Nasser al-Dossary ’s message broke from decades of Saudi orthodoxy that sought to keep prices high by limiting global oil production, said people familiar with the session. That set the stage for Saudi Arabia’s oil mandarins to send crude prices tumbling late last month after persuading other members of the Organization of the Petroleum Exporting Countries to keep production steady. Hard-hit countries like Iran, Russia and Venezuela suspected the move was a coordinated effort between the oil kingdom and its longtime ally, the U.S., to weaken their foes’ economies and geopolitical standing. But the story of Saudi Arabia’s new oil strategy, pieced together through interviews with senior Middle Eastern, American and European officials, isn’t one of an old alliance. It is a story of a budding rivalry, driven by what Saudi Arabia views as a threat posed by American energy firms, these officials said. Shale-oil production in places like Texas and North Dakota has boosted U.S. output, displacing exports to the U.S. from OPEC members and adding to global oversupply. Is This Why Saudi Oil Minister Changed Tack? 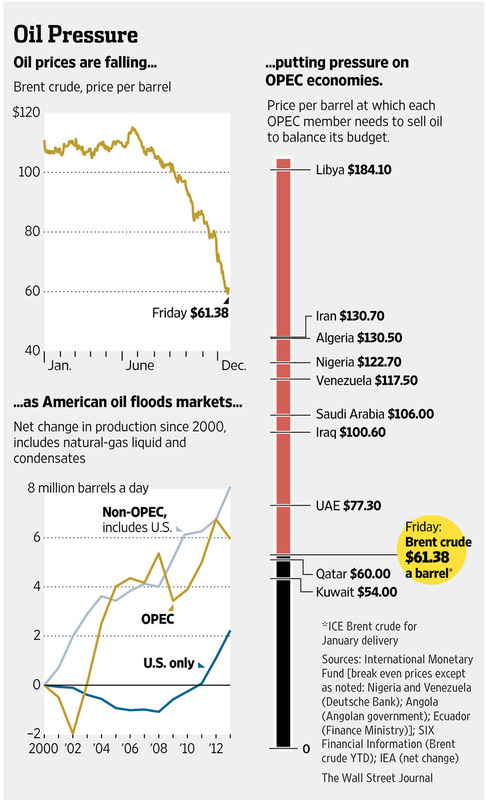 Where Will Oil Prices Go in 2015? Mr. Dossary’s October message signaled a direct challenge to North American energy firms that the Arab monarchy believes have fueled a supply glut by using new shale-oil technologies, said the people familiar with the session. Saudi officials became convinced they couldn’t bolster prices alone amid the new-crude flood. They also concluded many other OPEC members would balk at meaningful cuts, as would big non-OPEC producers like Russia and Mexico. If Riyadh cut production alone, Saudi officials feared, other producers would swoop in and steal market share. Saudi oil minister Ali al-Naimi tested that conclusion just 48 hours before the Nov. 27 OPEC decision, meeting in Vienna with oil heads of several big producer nations to suggest a coordinated output cut. As he suspected going in, he couldn’t get an agreement, said people familiar with the meeting. The option left: Let prices slide to test how long, and at what levels, American shale producers can keep pumping. OPEC’s Nov. 27 move helped drive crude prices to below $60 a barrel from over $100 this summer. 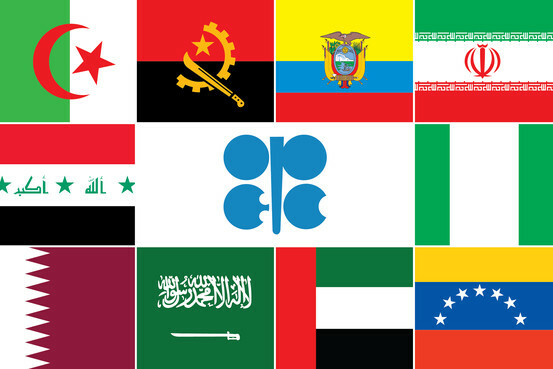 It fueled discord among OPEC’s members—and among other energy powers—who have grown accustomed to triple-digit oil prices padding their governments’ balance sheets. Mr. Naimi on Thursday said Saudi Arabia and OPEC had no choice but to keep production at current levels amid the price weakness. “In a situation like this, it is difficult, if not impossible for the kingdom or OPEC, to take any action that may result in lower market share and higher quotas from others, at a time when it is difficult to control prices,” the official Saudi press agency quoted him as saying. Mr. Naimi didn’t respond to inquiries. Saudi oil-ministry representatives wouldn’t comment for this article. The Saudi approach is part of a significant evolution in Riyadh’s relationship with Washington over the past decade. Close allies since World War II, the countries prospered on the kingdom’s providing a steady oil flow in exchange for America’s securing its borders. But the U.S.’s emergence as an energy rival is testing this foundation in ways not yet widely appreciated, said U.S. and Saudi officials, as have major differences over American Middle East policies. Saudi Arabia is taking a risk by letting oil prices plunge, said Arab, American and European officials. Saudi officials have said their economy can survive at least two years with low prices, thanks partly to the kingdom’s $750 billion foreign-exchange reserves. Arab officials believe many less-efficient producers will be driven out of the market. Still, some oil-industry executives said, Riyadh and Mr. Naimi may underestimate how technology and the shale-oil boom have fundamentally altered energy markets. Many U.S. companies, they said, can make money or break even with oil below $40. At about that time, Mr. Naimi’s deputy, Prince Abdulaziz bin Salman, another nephew of the king, worried to colleagues that the kingdom’s budget couldn’t bear lower prices long, said people familiar with the matter. The offices of Prince Abdulaziz and Prince al-Waleed didn’t respond to inquiries. Saudi Arabia and its massive energy reserves have played a major role in shaping world affairs for 50 years. During the 1980s, the Reagan administration credited the Saudis with maintaining high oil production to drive down prices and weaken the Soviet Union’s finances. The price drop also fueled an economic recovery in the U.S.
A spokesman for the National Security Council on Sunday said Washington’s alliance with Saudi Arabia remains strong and focused on cooperation on numerous economic and security issues. “Our bilateral relationship is built on over 70 years of close cooperation whether it is counterterrorism, military to military training, educational exchanges, energy security, or bolstering trade and investment,” said NSC spokesman Alistair Baskey. President Barack Obama ’s administration has worked closely with Saudi Arabia to try using energy markets to pressure Iran into constraining its nuclear program, according to U.S. and Saudi officials. Beginning in 2009, U.S. officials coordinated with Saudi Arabia, the United Arab Emirates and Kuwait to assure major buyers of Iranian oil would have alternatives if they weaned themselves off Tehran. But Washington’s relations with Riyadh have soured in recent years due to differences over the Obama administration’s handling of Middle East political instability. King Abdullah was incensed last year when Mr. Obama reneged on his pledge to launch military strikes against Syrian President Bashar al-Assad ’s regime following its alleged poison-gas use against civilians. Saudi officials also felt deceived after the Obama administration launched secret nuclear negotiations in 2012 with Iran, Riyadh’s regional rival. Washington is entering a new era in its Saudi Arabia relationship, although the alliance remains crucial to the global economy, said Amos Hochstein, the U.S. State Department’s special envoy and coordinator for international energy affairs. The American energy boom has further complicated relations, said U.S. and Saudi officials. Senior Saudi officials have appeared perplexed in recent months in gauging the impact of the American boom. In late September, Ibrahim al-Muhanna, a top adviser to Mr. Naimi, said publicly in Bahrain he didn’t foresee oil prices falling much below $90 a barrel due to what he said was the high cost of extracting North American shale oil. He didn’t respond to inquiries. 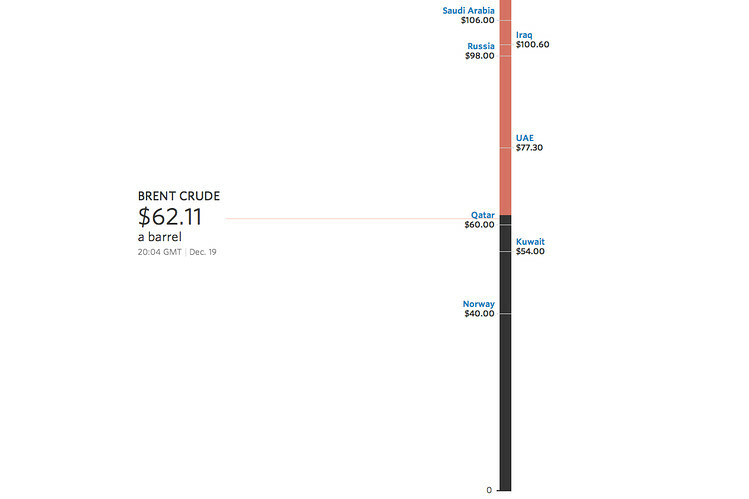 The Saudis largely kept silent as prices kept falling. Then Mr. Naimi went on vacation in late September, removing himself from a public debate over whether OPEC should rein in production at its November meeting. Mr. Naimi tended sheep before starting as an errand boy at Saudi Aramco, the national oil company. He worked his way to chief executive before becoming minister in 1995. He won a reputation for data-driven decision making. In the late 1990s, he focused on U.S. Midwest commercial crude-oil inventories—if levels got too high, OPEC needed to cut. 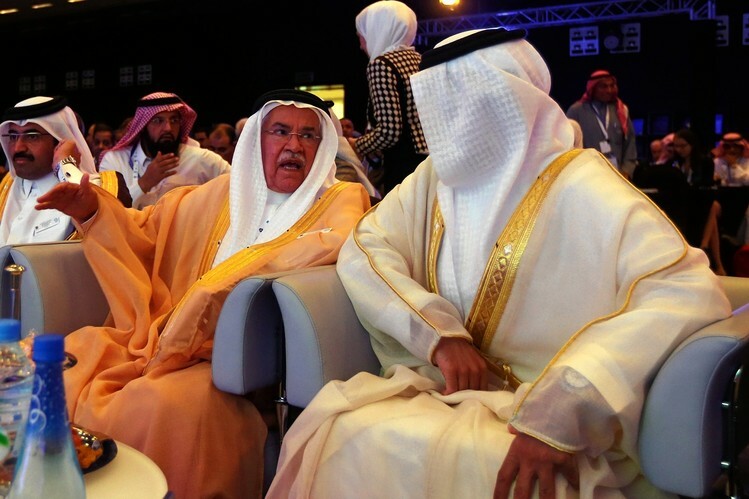 Mr. Naimi’s comments can rattle or soothe oil markets. So his vacation’s timing puzzled many of his colleagues, said people familiar with the matter, and during his absence there was bickering inside the government about how to arrest the price decline. The question: whether to focus on stopping the short-term revenue impact of the price decline or to exploit the medium-term potential of its reducing competition from North American shale producers. Meanwhile, OPEC members were slashing prices, often undercutting one another. In early November, Saudi Aramco cut prices to U.S. customers, a move aimed at locking in customers as shale output swelled, industry officials said. Returning from his holiday, Mr. Naimi met with Venezuela’s foreign minister and its chief OPEC representative, Rafael Ramirez, on a Venezuelan resort island. Privately, the Saudi told his hosts he would support a production cut only if the Venezuelans could persuade producers inside and outside OPEC to participate, people briefed on the meeting said. A Venezuelan foreign ministry spokeswoman declined to comment. Mr. Ramirez traveled to Russia, Algeria, Iran and Qatar to woo production-cut support. Two days before OPEC’s Nov. 27 meeting, he gathered senior energy officials from Russia, Mexico and Saudi Arabia—including Mr. Naimi—at Vienna’s Hyatt Hotel. On the table was a proposal to take two million barrels a day off the market, officials familiar with the talks said. 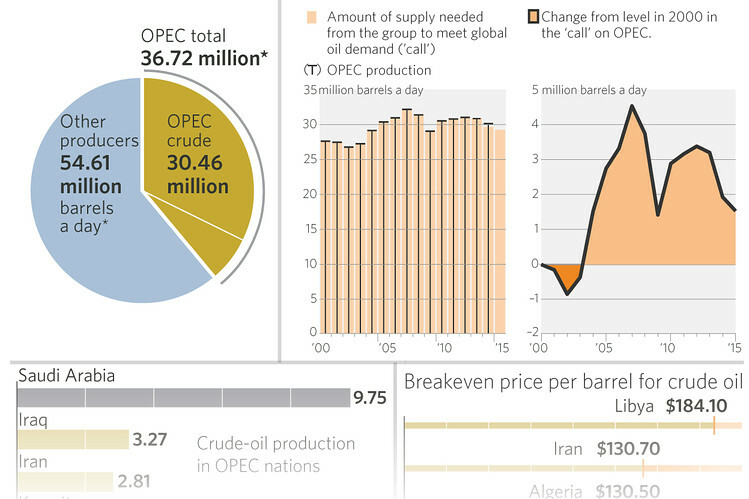 OPEC would shoulder the bulk of the cut, but Russia and Mexico were expected to trim a combined 500,000 daily barrels. Mr. Naimi had expected Russia to balk, these people said. Indeed, the Russian delegates said they couldn’t cut production for technical reasons and because they might lose pumping capacity by shutting wells. An official at OAO Rosneft, the Russian state oil company, confirmed the meeting took place but denied there were discussions about an output cut. The discussions never made it as far as what Mexico might be willing to do. “From the start, Russia made it clear that it wasn’t going to cut production, and the meeting ended there,” said a person familiar with the discussion. A Mexican energy-ministry spokesman didn’t respond to inquiries. Mr. Naimi argued it was in everyone’s interest to take collective action and that the market would eventually force the Russians to cut. 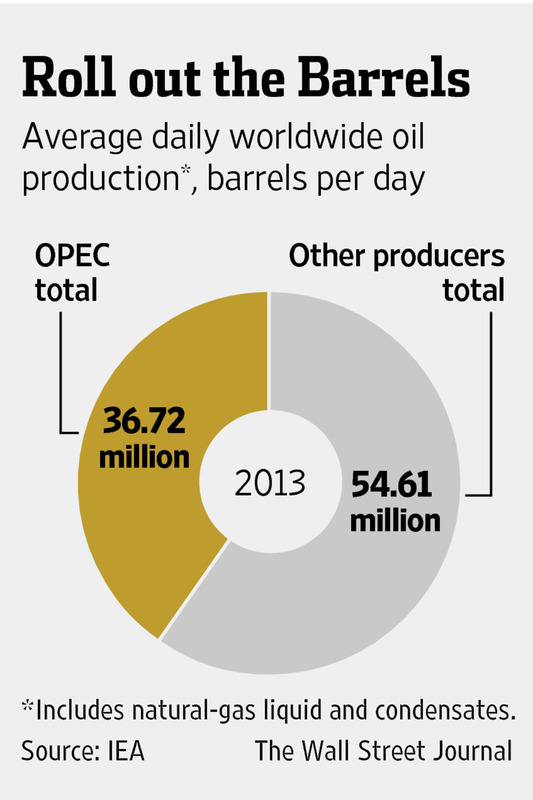 Russia, he said, couldn’t keep producing roughly 10 million barrels a day unless oil prices were over at least $100. Mr. Naimi headed to the Nov. 27 OPEC meeting with King Abdullah’s support to align OPEC’s Arab states behind a policy of no production cuts and of defending market share, said people familiar with his mandate. The U.A.E., Kuwait and Qatar gave their support ahead of the meeting. At the meeting, Mr. Naimi addressed other OPEC ministers, who were asked to leave aides outside the room. He conceded falling prices would be painful but said losing customers to U.S. shale would be worse, people briefed on his comments said. Mr. Naimi wasn’t advocating forcing down prices to hurt U.S. shale producers, these people said, but was warning that if OPEC cut output, non-cartel crude would likely replace it. OPEC ministers agreed to keep their production ceiling unchanged. Sell orders flooded oil markets. Shares in big producers tumbled, along with currencies of petro-states like Russia and Nigeria. U.S. and Arab officials have privately gushed that the decline could undercut the ability of Tehran, Moscow and Caracas to play destabilizing roles globally, and have voiced optimism that Iran’s financial woes could force it into more nuclear concessions. There remains a risk prices don’t quickly recover. Some in the Saudi media have criticized Mr. Naimi for a policy they say could be disastrous for the kingdom’s economy. Riyadh depends on oil for 90% of its budget.